On Sunday, 12th July the ADAMED SmartUP innovative science camp was commenced. For the next two weeks, young science enthusiasts will be improving their knowledge in the fields of physical and natural sciences, and they will also visit the most important research and development centres in the country as well as meet inspiring lecturers from leading universities in the world. 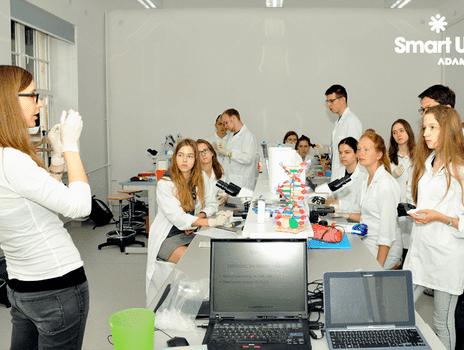 50 laureates of the 1st edition of the ADAMED SmartUP programme went to the first innovative science camp in Poland. They not only obtained the best results in the scientific recruitment game and the scientific test, but are also genuine science enthusiasts, who spend their free time in laboratories, at the meetings of after-school science clubs or international competitions. In fact, the persons who win this competition have convinced the ADAMED SmartUP Programme’s Scientific Council that they should be given a chance to begin this exceptional scientific journey. These young people will attend classes in four thematic groups (Chemistry and Biochemistry; Medicine and Medical Sciences; Engineering and Robotics; Physics and Nanotechnology) led by lecturers and researchers from the best universities and academic centres in Poland and abroad. The list of lecturers includes e.g. Dr Marcin Suskiewicz (graduate of the Department of Biochemistry at the University of Oxford; he defended his PhD dissertation at the University of Vienna), Antoni Wróbel (MSc in molecular and cellular biochemistry at the University of Oxford; MSc in medical sciences at the University of Cambridge; PhD in biochemistry at the University of Cambridge), Magdalena Richter (PhD student at the Institute of Biochemistry and Biophysics of the Polish Academy of Sciences and the Department of Genetics of the University of Cambridge), Anna Witkowska-Wróbel (PhD student at the ULC in London, physician and psychologist), Artur Jarząbek (MSc in Aircraft Engineering, graduate of the Imperial College in London and PhD student at the Technical University of Madrid), Rafał Chojecki (employee of the Institute of Automatic Control and Robotics at the Warsaw University of Technology and the member of the management board of VesaBox Sp. z o.o. ), Michał Kępa (PhD student at the Centre of Science at Extreme Conditions in Edinburgh, graduate of Physics and Philosophy at the University of Edinburgh) and Mateusz Żelazny (graduate of Theoretical Physics at the University of Edinburgh). Apart from an extensive scientific programme, the participants can count on many attractions and educational trips e.g. to the National Centre for Nuclear Research in Świerk and the Space Research Centre of the Polish Academy of Sciences. Those young scientists will also visit the Research and Development Centre of the Adamed Group. After the end of the camp, the best participants will be included in a 10-month educational tutoring programme to support them in planning their further educational development. This process will also make it possible to identify the grand prize laureates of the 1st edition of the ADAMED SmartUP – a unique scientific scholarship tailored to the laureates’ individual needs. The 2nd edition of the ADAMED SmartUP programme is scheduled for September and it will start with a competition for schools. To take part in the competition you have to prepare, as a group, an interesting educational lesson on a given topic. You are welcome to visit our website and follow our Facebook profile, where you can find comprehensive information on the initiatives associated with the ADAMED SmartUP programme. We offer our thanks to the participants of the camp – the Mechanical Faculty of Power and Aeronautical Engineering at the Warsaw University of Technology and Institute of Automatic Control and Robotics (Faculty of Mechatronics at the Warsaw University of Technology).